and a slaughterhouse in the other 11 month. The winner receive reputation as the train drive back to museum archive. Some people are powerful enough to determine if a work is an art or not. The young artist has little control over this art dictatorship. The 798 art district in Beijing has failed under this, where young artists moved in the cheap studio space, wishing to be well-known soon by a few critics. But once fame is established through judgment, that fame attracts wealth and rises the rent, putting an end to affordable studio space. 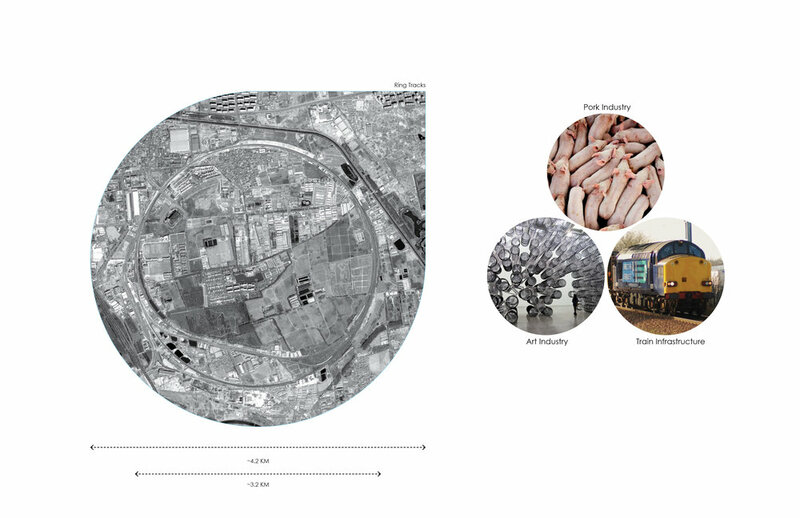 In spring 2017, at the east north of Beijing, a secret meeting is held among three directors in the ring village: the mayor of the pig farm village, the curator of the young artist community from 798 and the supervisor of the ring track train-testing facility. They propose a annual carnival event where the public and the jury pick a winner, boosting the career of the artist, as if lending a fame through a bank. The increased value of the artwork through this process benefits the bank, and so as to the local communities. 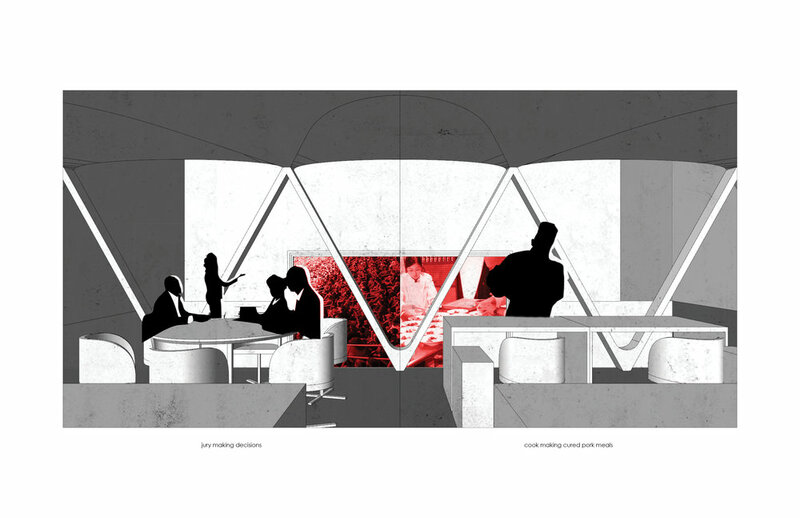 The ‘bank’ is designed with a dual-function: a slaughterhouse for local pork industry, as well as a periodically display venue for art community. The artists display their creation on the train car, enjoying their 15 mins of fame. The winner drive slowly back to the museum archive in a small loop, and the losers disappear over horizon. He is struggling to get a taste of fame at 798, hope to be heard from the critics, but is not working out. The rent has increased six times, but Tao is anonymous. Alternative consumable product, transformed from raw. The three directors ally as an ‘art bank’, and give artist a chance of 15 mins of fame. the public and the jury pick a winner, boosting the career of the artist, as if lending a fame through a bank. The art bank benefit through the auction of selected art. Pig farm agree to investigate money to promote ham products, a popular spring festival food. The track infrastructure is reused to provide mobile studio on train car that travel on ring so no rent of studio will be affected by a fixed real estate. The train car is also the stage that they will display the creation. They learn from the highly commercialised Rio sambadrome, where art event encourage a positive competition of reputation among local communities, and in the process encouraging artist to pursue their dreams under capital input. Interestingly, the local beer factory sponsors the entire renovation fee for the place in exchange for high exposure in public advertising. The product is associated with the event. 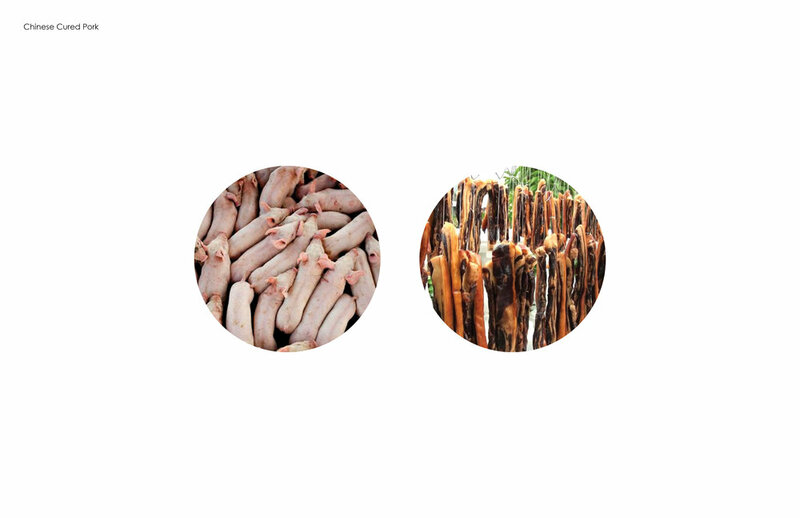 The two stories of fates for artists and pigs. The mayor of the pig village demand the slaughterhouse must be operational, and the curator demand the art bank to be able to display works with interesting perspective. The solution is found with the floor offset of slaughterhouse. The platform is raised to get easy access to the pigs, but also can be treated as sink floor path. The same path could provide unusual viewing angle for the visitors around the arts next to the path. The space for the slaughter house and the museum display share the same physical space. They encounter the other world in a variety of ways, each encouraging the visitor to see the connection between the killing of a pig to the creation of an artist. the function of slaughting and viewing share one roof. Urban Bridge, physical and functional. On urban scale, the slaughterhouse is sited over a segment of tracks, bridging the north and south side urban context that have been cut off. The subway station of the south of the plaza provide sufficient public transportation in the event of carnival. The two ends of the factory matches the simple massing of the neighboring factory, while the middle crossing over is centralized completely around the tracks. The world of art and pig collide in the middle. The subway station is integrated in the design so Once stepping outside one could immediately see the main cantilever with latest live streaming voting data projected. The two function shares space under one roof in different seasons, so the plans are designed with ambiguity to satisfy both programs. The bridge of viewing is chosen over conventional sloped seating because the usage rate is much less and bridge over provides a closer viewing point to the display below. The winner will slowly drive back to the archive zone in a small loop where the artist will receive cheers and even closer examination from the audience when placed along the galleries spaces inside, before either sold in the auction house or permanently collected by the bank. Tao should be happy, the fame he receives here put a price tag on his work. The mayor is happy, as the association of art festival and his pork product is a commercial success. The art is consumed, so are the cured pork. Reconnect the two urban fabric seperated by the tracks. Urban elevation matches the context buildings. 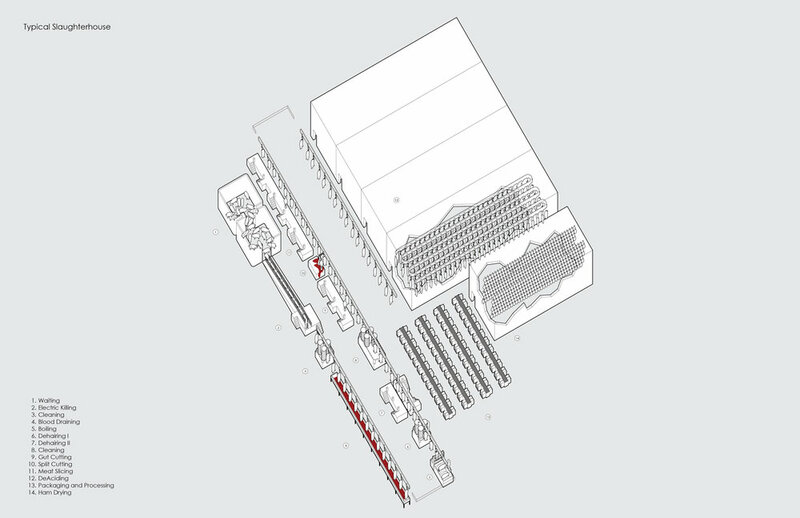 The ‘bank’ is designed with a dual-function: a slaughterhouse for local pork industry, as well as a periodically display venue for art community. During the 11 months preparing for the carnival, artists work and live on train cars that travel on the abandoned train ring track. The mobility ensures that no local real estate economy will be crashed due to the association with art fame, a lesson learned from the 798 art district. Meanwhile, the local pig farms in the village send the pigs to the slaughter factory where it is killed, packed and cured to Chinese prosciutto over the final months. In the 12th month the slaughter house is transformed into a temporary gallery that host the carnival. Visitors circulate through the path that transforms live pig to flavored ham, thrilled by participating the voting and collective appreciation. The artists display their creation on the train car, enjoying their 15 mins of fame. The winner drive slowly back to the museum archive in a small loop, and the losers disappear over horizon, to the ring track traveling for another year. As people enjoy the cured pork feast after the auction for the winner and take home cured meat for the Spring Festival, it seems that they have put a price tag on everything as it is consumed, eventually. The selected art in the auction house, value to be recycled by the bank. The selected art in the permanent collection. The art bank celebrating the carnival. Artist receiving crowd cheer as the train drive through the center.